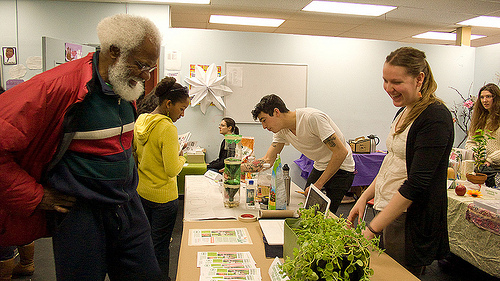 Browse: Home /	Community Building, Community Gardens, Events, Food, Permaculture, Street Gardening, URBAN FARM & GARDEN, Volunteer / Greening Flatbush 2012: Garden Where You Are! Greening Flatbush is back, Sunday March 25th. Get involved! Sustainable Flatbush will host our 4th annual Greening Flatbush: Garden Where You Are, on Sunday, March 25th at 2pm. The event will be held at the historic Flatbush Reformed Church, host of our compost and gardening initiatives, located on Flatbush and Church Avenues. 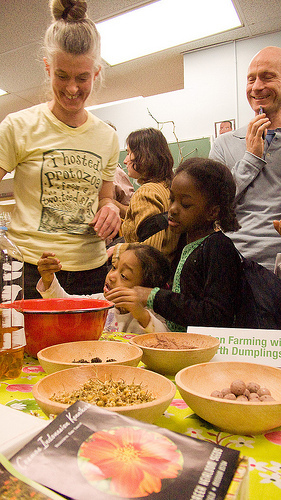 This year, Greening Flatbush promises to be better than ever — an event the entire family can participate in and enjoy. Our annual extravaganza celebrating community gardening, neighborhood greening, and urban agriculture will feature, from 2 – 5pm, hands-on workshops, interactive demos, DIY projects, creative arts, and live entertainment, presented by Sustainable Flatbush and a curated roster of community-based groups. The day will culminate in a delicious Community Meal from 5 until 7pm. In addition to interactive displays from a wide variety of community organizations (check out info and photos from last year’s event! ), Sustainable Flatbush will offer workshops on Gardening with Native Plants, Composting, Community Engagement, and Solar for Community Gardens. There will be live entertainment and a delicious meal prepared for the whole community. Like our first Community Meal on January 28, which attracted over 120 people, this is an opportunity for neighbors to meet neighbors and to share, learn, and build relationships around sustainable living in our communities. Greening Flatbush: Garden Where You Are engages and empowers people from all over Brooklyn and beyond to participate in creating sustainable urban neighborhoods. Our goal is for YOU to discover (or create!) a project within walking distance of your home where you can get involved in making your community greener — whether it’s by learning to compost, joining a CSA or community garden, adopting a tree, or growing flowers on your windowsill! While bringing more visibility and participants to sustainable neighborhood-based projects, Greening Flatbush will also be a great opportunity for all of us to get acquainted with like-minded organizations and people, form partnerships, and strengthen the growing network of environmental stewardship in Brooklyn. You can be part of this event! Click here for information on how to get involved as a volunteer or sponsor. Greening Flatbush is free, with a suggested donation of $10 for the event and the community meal. Let us know you’re coming! Please RSVP here.